Rome's invisible inhabitants - prostitutes, innkeepers, housewives, priests, freedmen, slaves, soldiers and gladiators - brought back to life. 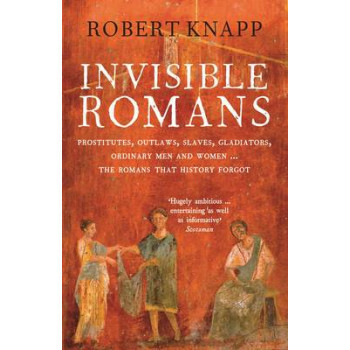 Robert Knapp seeks out the ordinary people who formed the fabric of everyday life in ancient Rome and the outlaws and pirates who lay beyond it. They are the housewives, prostitutes, freedmen, slaves, soldiers, and gladiators who lived commonplace lives and left almost no trace in history - until now. But their words are preserved in literature, letters, inscriptions and graffiti and their traces can be found in the histories, treatises, plays and poetry created by the elite. A world lost from view for two millennia is recreated through these, and other, tell-tale bits of evidence cast off by the visible mass of Roman history and culture. "Invisible Romans" reveals how everyday Romans sought to survive and thrive under the afflictions of disease, war, and violence, and to control their fates under powers that both oppressed and ignored them. Their lives - both familiar and foreign to ours today - are shown against the tumult of a great empire that shaped their worlds as it forged the wider world around them.